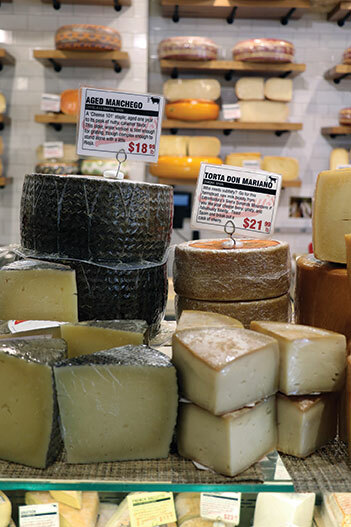 Editor’s note: Passport to Cheese is Cheese Market News’ feature series exploring the dairy industries of nations around the world. Each month this series takes an in-depth look at various nations/regions’ dairy industries with coverage of their milk and cheese statistics and key issues affecting them. The nations’ interplay with the United States also is explored. This month we are pleased to introduce our latest region — Spain and Portugal. MADISON, Wis. — Spain and Portugal are known for their flavorful cuisine, and their traditional cheeses reflect rich and varied landscapes. Sheep’s and goat’s milk cheeses are common in many areas of this region, while Spain’s northern Asturias region leads the country in cow’s milk production and produces a wide variety of cow’s and mixed milk cheeses. BERIAN CULTURE — Murray’s Cheese of New York carries 20-25 varieties of cheeses from Spain and Portugal, from traditional staples to unique and newer cheeses from micro-creameries in the region. Above are aged Manchego, Spain’s famous sheep’s milk cheese and one of Murray’s best-sellers, displayed with Torta de Cabra don Mariano, a raw goat’s milk farmstead cheese from Zamora, Spain. “It’s hard to speak in generalities about the Iberian peninsula, because the cheeses are very different from region to region,” says Walshe Birney, associate director of merchandising for New York-based Murray’s Cheese, which typically carries 20-25 different cheese varieties from Spain and Portugal. Despite it being a mountainous region, compared to the rest of Europe, Spain is a large country with lots of open space where sheep, goats and cows roam and feed. Cheese generally stands on its own in Spain and Portugal, eaten as an appetizer, hors d’oeuvre, breakfast or dessert alongside bread, fruit, membrillo (quince paste) and other accompaniments. It is not often used in traditional recipes, and consumption per-person is lower than in many other European countries. Grupo Lactalis Iberia SA leads cheese sales in Spain with a value share of 15 percent in 2015, while Fromageries Bel Portugal leads the Portuguese cheese market with a 21-percent value share in 2015, according to Euromonitor International. Spain today is home to about 1,000 cheese producers, but as recently as the 1980s, many of its traditional cheeses were considered illegal and had to be produced in secret. The quotas were created in the mid-1960s under Francisco Franco’s government and lasted until the 1980s, after the country transitioned to a democracy. Enric Canut, an agricultural engineer and cheese and dairy consultant who works to promote Spain’s artisan cheeses, worked to survey the country’s farmstead and artisanal cheese production after the end of Franco’s reign and found that 25 percent of Spain’s cheese production at that time was illegal. Canut taught classes on cheesemaking throughout Spain and helped revive the artisan cheesemaking industry, even bringing back one Catalan goat’s milk variety — Garrotxa — that had all but disappeared by the 1980s. This week, Canut showcased the “Spain, the land of 100 cheeses” campaign at Alimentaria, an international food and drink exposition in Barcelona, Spain. Now in its 20th year, the campaign focuses on the wide range of cheeses presented by Spanish dairy microenterprises. “The big dairies are getting bigger, but the small cheesemakers are around the country and markets,” Canut says. 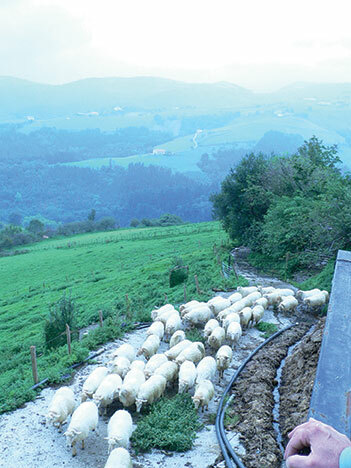 GREEN PASTURES — Sheep roam and graze on lush pastures in the Basque Country of northern Spain, where the popular Idiazábal — a raw sheep’s milk DOP cheese — is produced. Spain’s most famous cheese is Manchego, a protected-origin designated (DOP) cheese made in the country’s La Mancha region from Manchega sheep’s milk. It is available in both young and aged varieties. Both young and aged Manchego are best-sellers at Murray’s Cheese, but there also is interest in some of the more unique, regional cheeses, Birney says. Last year, Murray’s teamed up with Canut for a new program direct-importing very small-batch regional cheeses from Spain. “We now have a very unique selection of lesser-known Spanish cheeses, which allows us to tell the stories of the myriad of Spanish traditions in a more effective way,” Birney says. While various types of cheeses are produced all over Spain, one region known for its wide variety of cheese is the northern Asturias. This region nestled between the Cantabrian Sea and Cantabrian Mountains is known for its grazing pastures and is home to more than 40 types of cheese, including four DOP varieties. Asturias is particularly known for Cabrales, a DOP mixed-milk Blue that is one of Spain’s most famous cheeses, according to José Gonzalez of Asturian cheese exporter Atlantica. Harris notes that he recently has noticed more Spanish cheeses with added flavors — dipped in wine, or rubbed with rosemary or Spain’s famous smoked pimentón (paprika). He says La Tienda’s customers most appreciate the variety of Spanish cheeses. “You can have a great Idiazábal, a smoked aged sheep’s milk cheese from the Basque Country, to a completely different Galician Tetilla, a soft melting cheese,” he says, adding that people gradually are becoming familiar with more types of Spanish cheeses. Like Spanish cheeses, Portuguese cheeses typically are made from sheep’s or goat’s milk and many are aromatic and strongly flavored. Online specialty food retailer igourmet.com notes that of the approximately 15 varieties of Portuguese cheese, many have been given DOP status, including Queijo de Nisa, a robust and earthy-flavored cheese made from the raw milk of Merino sheep. In 2015, the United States imported 23.9 million pounds of cheese from Spain and almost 1 million pounds of cheese from Portugal, according to U.S. Census Bureau trade data. Imports of Spanish cheeses have increased more than four-fold in the last 10 years. Canut notes that the United States and European Union are the main export markets for Spanish cheeses. Birney says Murray’s Cheese aims to include best-in-class cheeses from all of the important regions in Spain and then layers on smaller, more unique offerings that are rotated on a regular basis. “As Spain is a very old and traditional cheesemaking region, you don’t see as many ‘new’ cheeses being produced as say, the United States, so you have to seek them out a bit more,” Birney says, adding that some of Spain’s tiny micro-creameries are now producing some fascinating cheeses. “It’s a very exciting time, as within the last few years the landscape of what we’re seeing coming out of Spain and into the U.S. has really started changing,” he adds.